The province of Sisaket in Thailand was attacked by three thousand monkey-robbed monkeys. From their raids, two villages and a Buddhist monastery have already suffered. 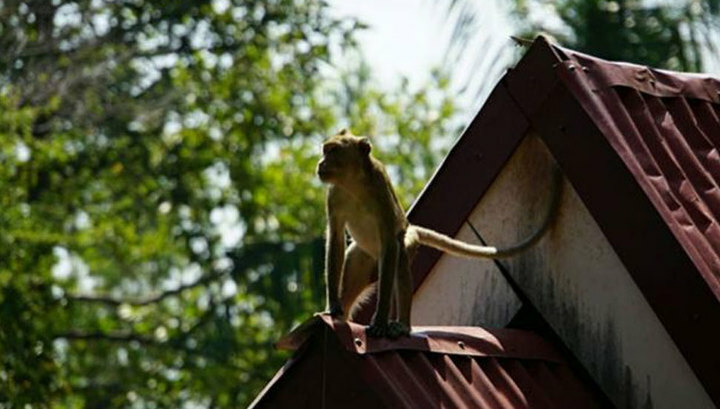 Locals closed the windows and doors of their homes, but the persistent macaques still got into the houses through ventilation. They scattered things, scattered food from refrigerators, and inflicted damage on crops in fields, leaving people without crops. A lot of troubles and troubles were brought to animals and monks in a Buddhist monastery. The monks tried to feed the macaque with food, which they brought as donations, but it was also lacking, and they continued to be disgraceful. As noted by Thai media, local residents consider the crab-eaten macaque as a tourist attraction, which is why they treat their disgrace with tolerance. However, in recent times, due to the overgrown population, primates lack traditional feed sources, and so they began to raid people’s homes and fields with crops. Now, local residents are forced to appeal to the authorities with a request to still limit the growth of the population of these macaques.